The United States Mint today revealed designs for the 2013 America the Beautiful Quarters, the sixteenth through twentieth coins under the America the Beautiful Quarters® Program. 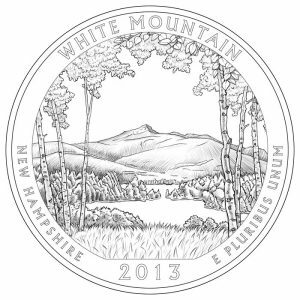 The same five sites and designs will appear on numismatic 2013 America the Beautiful Five Ounce Silver Uncirculated Coins and investment-grade 2013 America the Beautiful Five Ounce Silver Bullion Coins. These are the larger, three-inch diameter coins that are composed of five ounces of 99.9% pure silver. Release dates for each silver coin is not yet available. Images of the five reverse designs are below along with a short description of each design. Depicted on the reverse is Mt. Chocorua framed by birch trees. Mt. Chocorua is the easternmost peak of the Sandwich Range. 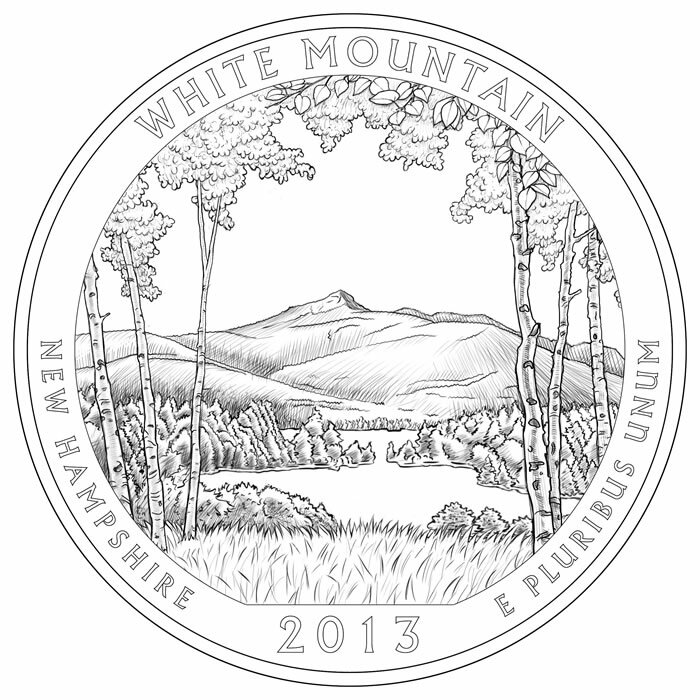 Surrounding inscriptions are WHITE MOUNTAIN, NEW HAMPSHIRE, 2013, and E PLURIBUS UNUM. This reverse design was created and sculpted by U.S. Mint Sculptor-Engraver Phebe Hemphill. Depicted in the scene is the statue of Master Commandant Oliver Hazard Perry with Peace Memorial toward the background. Peace Memorial is one of the tallest of its kind in the United States. 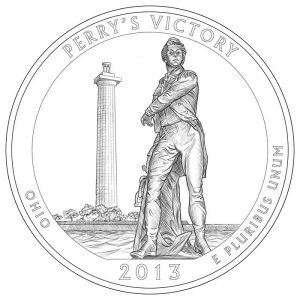 Inscriptions include PERRY’S VICTORY, OHIO, 2013, and E PLURIBUS UNUM. This reverse design was created and sculpted by U.S. Mint Sculptor-Engraver Don Everhart. Great Basin National Park has Bristlecone Pine groves with trees older than 4,000 years. 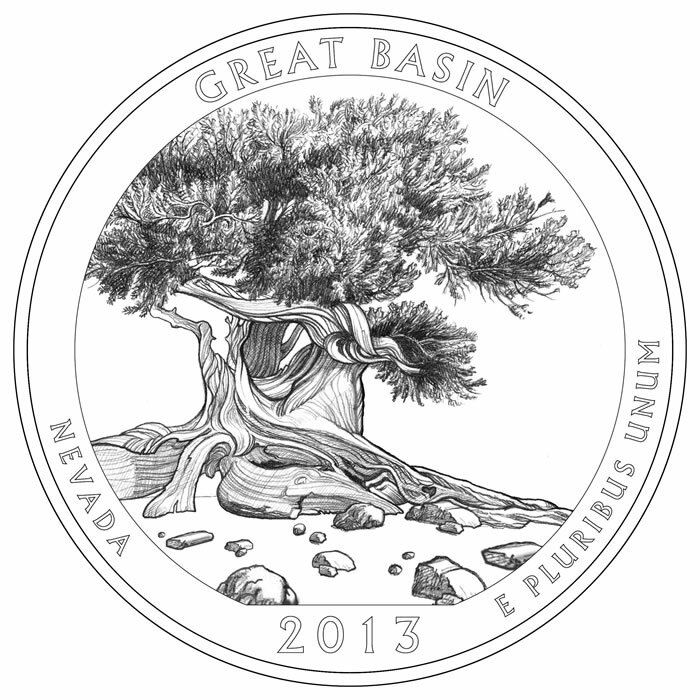 The coin’s reverse shows a Bristlecone Pine tree and the rocky glacial moraines where they grow. 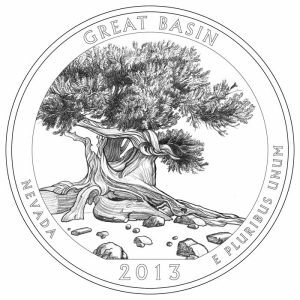 Encircling inscriptions are GREAT BASIN, NEVADA, 2013, and E PLURIBUS UNUM. This reverse design was created by U.S. Mint Artistic Infusion Program Associate Designer Ronald D. Sanders and sculpted by U.S. Mint Sculptor-Engraver Renata Gordon. Depicted is a scene from a "Defenders Day" celebration, an annual event held at Fort McHenry. The fireworks symbolize the "rocket’s red glare," linking the fort to its historic past. 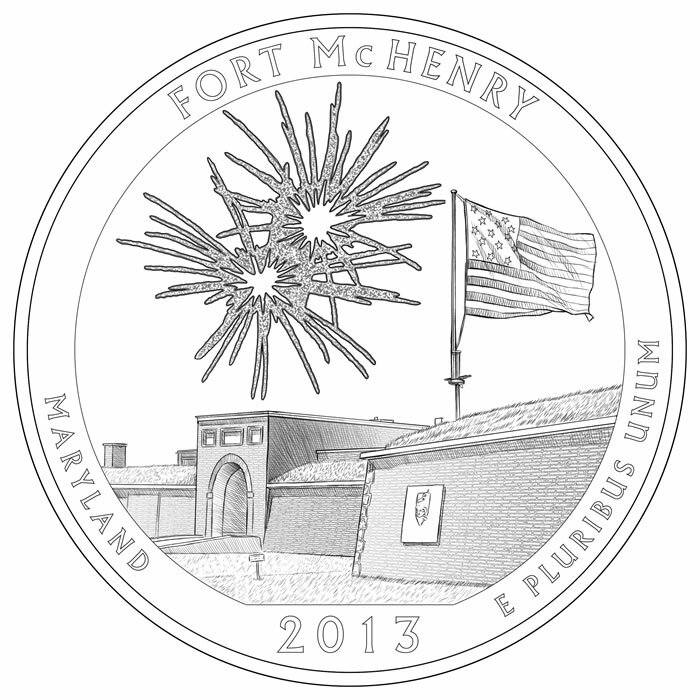 Surrounding inscription are FORT McHENRY, MARYLAND, 2013, and E PLURIBUS UNUM. This reverse design was created and sculpted by U.S. Mint Sculptor-Engraver Joseph Menna. 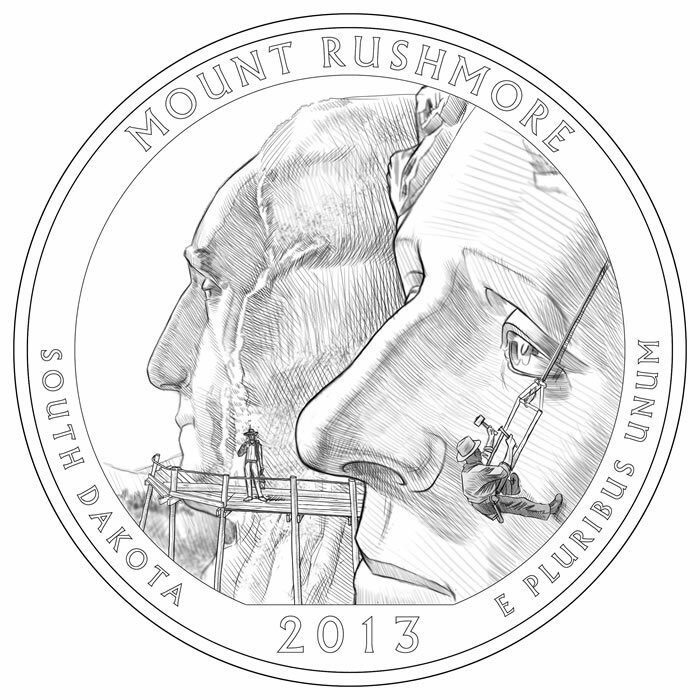 Mount Rushmore was depicted on three 1991 Mount Rushmore Golden Anniversary Commemorative Coins and on the 2006 South Dakota quarter released during the 50 State Quarters® Program. The latest coin design was inspired by photos of men who are adding the finer details to Thomas Jefferson’s face. 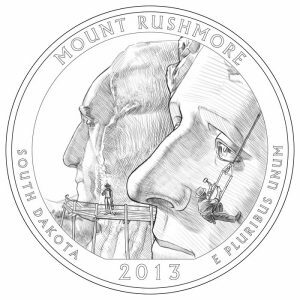 Inscriptions include MOUNT RUSHMORE, SOUTH DAKOTA, 2013, and E PLURIBUS UNUM. Obverses ("heads side") of America the Beautiful coins feature the familiar portrait of George Washington. Designed by John Flanagan, the same basic image has appeared on quarters since 1932. Whether quarter or five ounce silver coin, the encircling words are also the same: UNITED STATES OF AMERICA, LIBERTY, IN GOD WE TRUST and QUARTER DOLLAR. America the Beautiful coin reverses ("tails side") have unique designs, as seen in the larger images above, depending on the national park or national site honored. Inscriptions surrounding the design always include the name of the site honored, the state or territory it resides in, the year and E PLURIBUS UNUM. America the Beautiful Quarters have reeded edges but edges on every five ounce silver coin has letterings of 999 FINE SILVER 5.0 OUNCE. America the Beautiful Quarters launched in 2010 and will continue through to at least 2021 for a total of 56 unique designs. The program is authorized by the America’s Beautiful National Parks Quarter Dollar Coin Act of 2008 (Public Law 110-456). The Act states that reverse designs on the America the Beautiful Quarters must be emblematic of a national park or other national site in each state, the District of Columbia and the five U.S. territories of Puerto Rico, Guam, American Samoa, the U.S. Virgin Islands and the Commonwealth of the Northern Mariana Islands. For information about the first fifteen designs and related products under the program, check the section in this site on past quarter news. 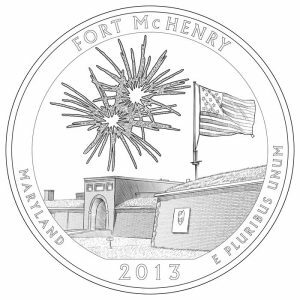 America the Beautiful Quarters are released in an order in which national sites were first established. How much will silver be worth in 2021? Whatever you’re willing to pay for it. I like all of these except the Mt. Rushmore design. Those stone workers dangling from ropes will be imperceptible on the finished circulating coin. The 5 OZ however, will show them. Still, we’re not seeing Lincoln or Roosevelt, which makes the design incomplete. i hope the same fate that happened to the old man in NH happens to his face. Looks like hills instead of mountains for New Hampshire 1/4.